You’re probably reading this page because you already know a raw vegetable diet will help you lose weight fast. I can assure you that there is much more to be gained from giving yourself a raw vegetable diet boost than simply losing weight. Think about all those magical phytochemicals that Nature provided which Science hasn’t yet fully decoded. Eating more raw vegetables that are also high in vitamins, minerals and antioxidants will boost your energy, immunity and vitality too. 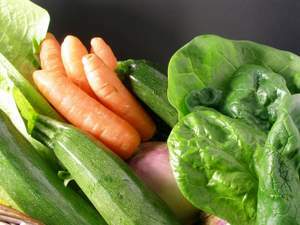 Increasing the amount of raw vegetables you eat will definitely also help you lose weight. I’m about to tell you the easiest ways to increase your raw vegetable diet intake. Read on to learn about the 3 best vegetables for dieting along with a couple of very handy tips and tricks for getting them into your diet without endless chewing! To get your raw vegetable diet started, focus on these 3 vegetables and include them in your meals and snacks for a week. I believe these are the 3 best vegetables for dieting because they’re the most popular, available and versatile.